Use of speech analytics is increasing in banking, finance, insurance, and business process outsourcing as companies look to get more value from the spoken word coming from prospects and customers. By putting speech analytics systems to use in contact centers, companies can capture conversations in order to detect behavior patterns, draw conclusions, and produce data that informs business decision making. In addition, agents, supervisors, and product planners can develop business plans with insight gleaned from speech analytics. Speech analytics tools and platforms can deliver searchable data and insights. Speech analytics impacts and benefits produce fulfillment of core competencies, including agent training, regulatory compliance, and support of marketing and product development business objectives. The graphics in this blog are from the Opus study. Although the study is global, I focused on U.S. respondents. The definition of speech analytics for the contact center can vary depending on who you ask. In one definition, speech analytics is the process of analyzing recorded calls to improve agent performance and customer experience. Another definition is monitoring calls for certain language or acoustic characteristics that can be used to locate the root cause of the customer call so the best agent and site resources can be focused on the customer call. Others have added real-time speaker analysis. There is no single speech analytics definition, as each organization deploying speech analytics will leverage the technology for the way it does business. The U.S. market is expected to be more experienced and therefore reflects a pragmatic view of the pitfalls when deploying speech analytics platforms and tools. The study determined that “rapid recognition of customer intent” tops the list of deployment drivers, at 45%, among U.S. respondents. The next three factors are statistically similar (40%-42%) and include three separate-but-equal concerns. Remediating the root cause of customer experience (CX) failures are dominating decision makers’ priority list. Webcasts, videos, articles, whitepapers, and blog posts inundate customers. CX professionals need to be customer-centric and deliver content that both attracts and retains the customer’s attention. Few technologies available today provide tools for CX failures in real-time detection and remediation. This is recognition by 40% of respondents that speech analytics can fill this gap. Support of agent training (40%), demonstrates a longstanding driver that is now on a par with delivering better customer experience. Increased sales and collections shows that an equally large number of decision makers are business pragmatists. They see the benefits of analytics-based pattern recognition combined with real-time reporting tools that have direct impact on revenue of interest to sales and marketing. An area not covered in the study is the use of speech analytics results influencing the website. By studying the callers and agent speech, the business can discover what words and phrases grab attention and hold callers’ interest. The discovered words and phrases can then be incorporated into the website, thereby producing more interactions with customers even before they speak to agents. 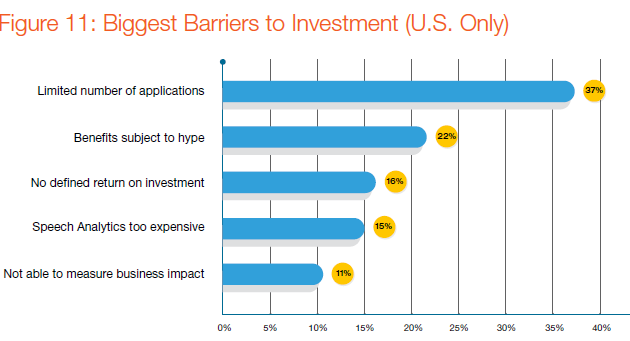 The limited number of applications was reported as a barrier of adoption with 37% of respondents. The report states that this figure is expected to decline. This conclusion is based on broadening awareness of applications that support improved CX and agent productivity, profitability delivery, and other business objectives. Expense is a concern of 16% of the respondents, followed by 15% concerned about return on investment and 11% unable to measure the business impact. What the study didn’t investigate are the IT staff limitations when working with speech analytics. What does the IT department have to do to make speech analytics useful while not overspending? 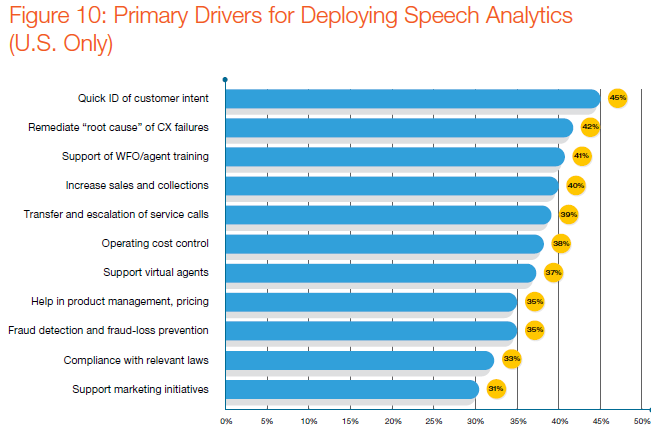 Speech analytics adoption is continuing to expand globally beyond the U.S. and is driven by better customer experience and employee/agent efficiency. Compliance issues have reduced since last year, making concern over GDPR, HIPAA, PSD2, and PCI last year’s news. Real-time applications, such as rapid recognition of caller intent and suggestions of next best action, are on the upswing, anticipating conversational commerce. Speech analytics results are commonly supporting marketing plans and other business objectives. Those looking at speech analytics expect to implement virtual agents and chatbots soon. There are significant differences outside the U.S. when looking at attitudes, impressions, and future plans. If you haven’t studied speech analytics for your business, you need to start now. Your competition is probably on the path to speech analytics applications already!